AFB Bronze MERV 6 18x24x2 Pleated AC Furnace Air Filter. Pack of 6 Filters. 100% produced in the USA. The AFB Bronze filter by AirFilterBuy is a step up from a standard fiberglass filter. It is designed for everyday home use and removes dust mites and debris from the air. Whenever you are choosing an air filter, make sure that you compare the nominal and actual size of the furnace filter that you are replacing. In this case, the ‘nominal’ size of the filter is18x24x2 while the ‘actual’ size of the filter is 17.5 x 23.5 x 1.75. Generally, the nominal size is rounded and in bigger print while the actual size is in smaller print and in parenthesis to the side. The AFB Bronze filter is designed to last 3 months, or 3 times the average fiberglass filter. The filters ship directly from the manufacturer to your doorstep, allowing AFB the ability to offer a premium product at a reasonable price. Each quantity purchased is for a pack of 6 filters. Note that AFB filters come in AFB Bronze (Merv 6), AFB Silver (Merv 8), AFB Gold (Merv 11), and AFB Platinum (Merv 13). The most commonly used filter for home or business use is the AFB Silver (Merv 8). If you have pets or allergies we recommend the AFB Gold (Merv 11). If you have asthma or other respiratory illness, we recommend the Merv 13. 18x24x2 pleated air / furnace filter. Perfect for home or business use. Each purchase is for a pack of 6 filters that can replace any standand furnace or air conditioning filter. Manufactured by AFB in the USA, using 100% US components. MERV rating of 6. Basic pleat that filters pollen, mold, and dust. AFB is a leading manufacturer of air filters, made in a US factory and shipped direct to your door. 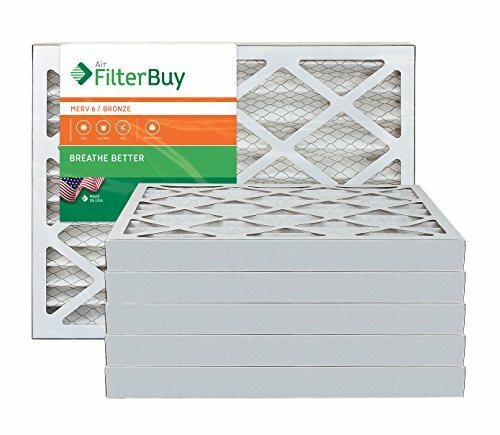 AirFilterBuy: Breathe Better! If you have any questions about this product by FilterBuy, contact us by completing and submitting the form below. If you are looking for a specif part number, please include it with your message.